The concept of an active "living museum" is evidenced by the dozens of different exhibits, events, meetings and functions held at the Plumas County Museum. Permanent exhibits include an outstanding collection of baskets woven by the area's original Mountain Maidu Indians. The Industrial History Wing features Railroads of Plumas County, Gold Mining on the Feather River, and TIMBER!, an exhibit about the lumber industry of the county. Other developing collections include natural history specimens, audio-visual resources, the Chinese influence, historical competitive ski racing known as "longboarding," medical exhibits, and children's toys. The Exhibit Yard provides visitors with a look at some of the equipment used by Plumas pioneers to wrest a living from the area's natural resources. A sleigh, horse-drawn hearse, water wagon, hydraulic mining monitors, logging equipment, a working blacksmith shop, a stamp mill and a restored gold miner's log cabin are just some of the items found here. While the basis of the museum's collection is historical, the Stella Fay Miller Mezzanine Gallery features contemporary cultural displays by county artisans. The museum's archival library houses its comprehensive collection of official county records, vintage photographs, documents, records and literature, which is continually augmented to compile a permanent record of Plumas County people, places and activities. Its value as a research and resource center is immeasurable. The Museum Bookstore sells local and regional historical books and publications, note cards, postcards, calendars, prints, and locally mined and fashioned gold nugget jewelry. An additional attraction is the fully restored 1878 Variel Home behind the museum. Passing through American Valley in 1852 on the Beckwourth Emigrant Trail, Joshua and Mary Variel returned in 1878 to build the home. The home is owned by the Plumas County Museum Association, Inc. and is open on weekends and by appointment in summer. 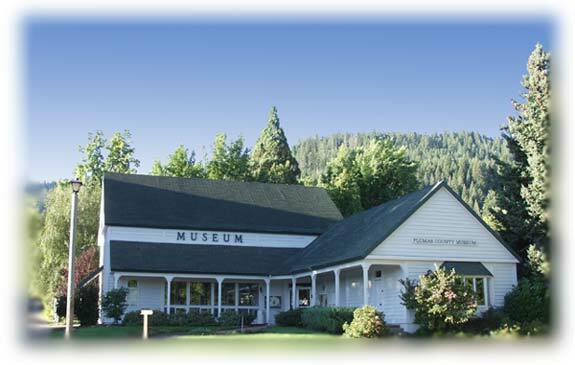 Due to severe budget cuts the Plumas County Museum Association is open Tuesday through Saturday 10 a.m. to 4 p.m. Call for Sunday hours.